Sony MDR-1000X noise-cancelling Bluetooth headphones review: Better than Bose Quiet Comfort 35? Bose is better at masking jet-engine drone, but Sony is no slouch on that score and ultimately it offers the better-sounding cans. 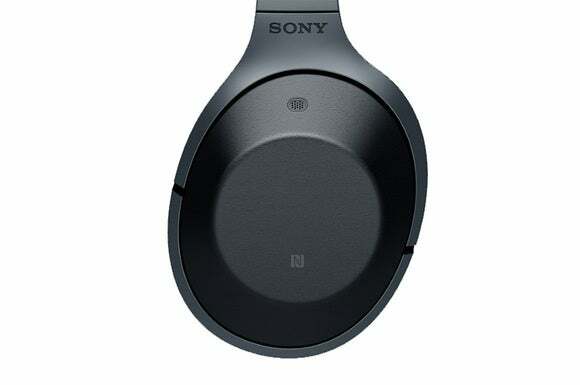 Sony is a respected brand in the mainstream headphone market, and deservedly so. But ask the average consumer about noise-cancelling headphones and they’re apt to mention a different brand: Bose. And deservedly so—even if only because of the company’s relentless marketing campaigns for its QuietComfort line (although to be fair, Bose founder Dr. Amar Bose was first to commercialize the concept). Sony’s new MDR-1000X Bluetooth headphones aren’t the company’s first effort building noise-cancelling headphones, but they are a prime threat to knock Bose off its throne. They won’t convince everyone of their superiority, but they are pretty great cans. 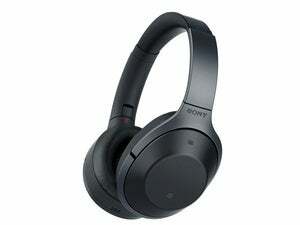 Sony’s active noise cancellation is superb. Small microphones mounted inside as well as outside each ear cup detect ambient noise in the environment. The headphones then produce mirror-image sound waves that cancel those unwanted noises without masking desirable frequencies in the music you’re listening to. I’ll dive deeper into that later. On the audio side, the MDR-1000X use a 1.57-inch driver with a liquid crystal polymer diaphragm capable of reproducing a frequency range of 4Hz up to 40kHz—both extremes are well beyond the range of human hearing. 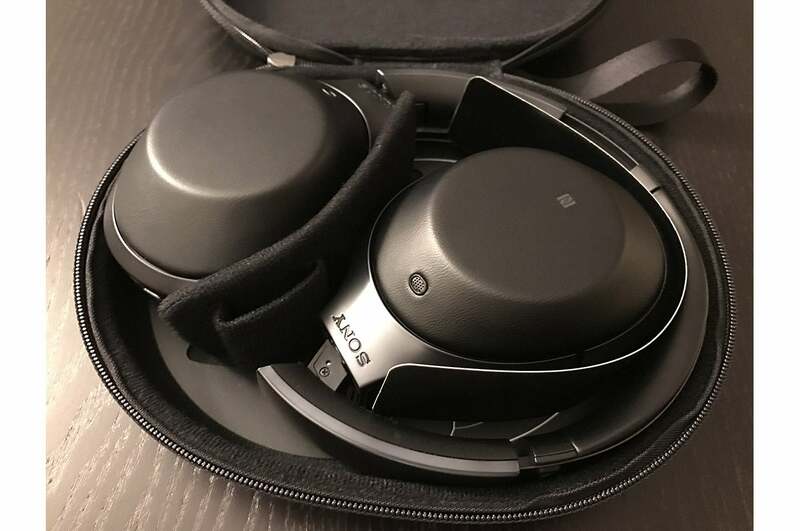 If you intend to use the MDR-1000X as wired headphones, you’ll be happy to note that they are relatively easy to drive, presenting 46 Ohms of impedance. NFC makes Bluetooth pairing supremely easy if your smartphone or digital audio player also supports near-field communication. Simply tap the two devices together and you’re done. 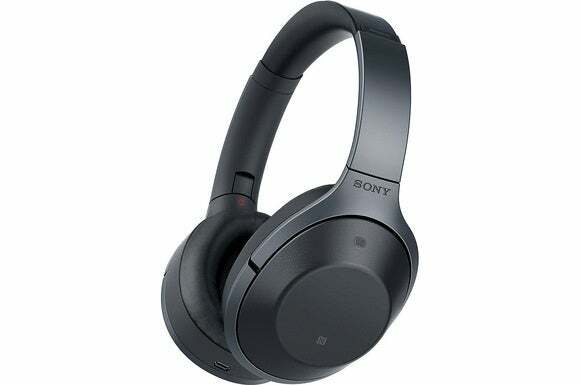 Support for Sony’s LDAC Bluetooth codec means these headphones can receive high-res audio content without requiring any down-conversion (DSD being a notable exception). LDAC can stream up to 96kHz/24-bit audio at rates as high as 990Kbps over a Bluetooth connection. As with most other Bluetooth codecs outside the Bluetooth standard (e.g., aptX), LDAC must be supported by both the player and the receiver. Since none of the high-res digital audio players I had on hand—including Sony’s own NWZ-A17—support LDAC, I was unable to test this feature. If you listen mostly to lossily encoded music files (iTunes, MP3s, or WMA tracks, for example), take note that the MDR-1000X also includes Sony’s S-Master HX amplifier and its DSEE HX digital sound enhancement engine that upscales compressed digital audio files. Sony gets high marks for its design effort. The MDR-1000x are extremely lightweight and portable. The arms collapse and the ear cups fold flat for travel, and they’ll slip easily into a backpack, carry-on, or large handbag. I compared them head-to-head and side by side with Bose’s flagship Quiet Comfort 35 headphones. When folded, both headphones are almost exactly the same size, and just a few centimeters separate the size of their carry cases. Sony’s and Bose’s cases are similar in size. Compared to the QC35, the MDR-1000x feel snugger, with plush synthetic-leather ear cups that fit closer to your ears and offer better passive noise isolation. If you have large ears, you might find that your ears brush the edges of the ear cups. 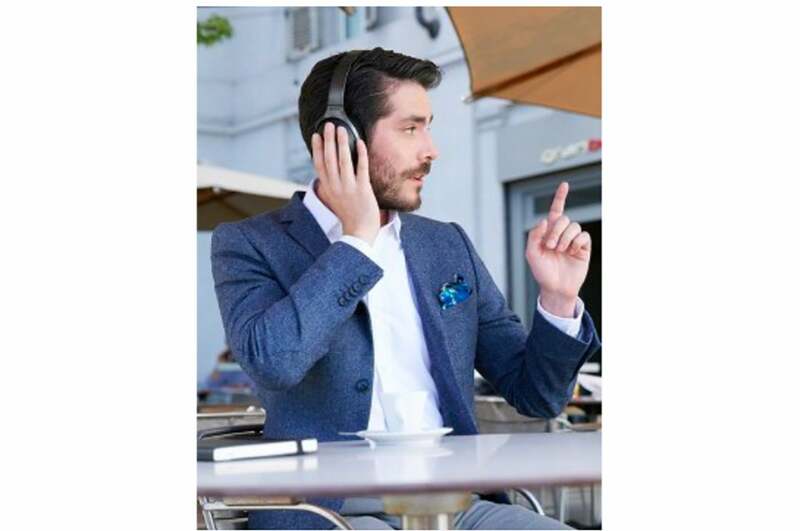 They don’t create the same cavernous sense of space around your ears that the Bose do. The right ear cup possesses some special magic—it’s a flat touch-sensitive gesture pad that you can use for audio control. While in wireless mode, you can swipe your finger toward the back of your head to rewind the song you’re playing or go to the previous one. Swiping forward advances to the next song. Touching the middle of the ear cup toggles pause and play. Finally, swiping up turns the volume up and swiping down lowers it. This isn’t a gimmick, it handily solves the problem of figuring out which button does what on headphones. Most over-the-ear headphones are good at reducing ambient noise even without electronics, but the MDR-1000X is better than most. Still, there are times when you want to hear your music and hear what’s going on around you—when you’re waiting to hear a boarding call at the airport, for instance. Sony’s MDR-1000x compared to Bose’s Quiet Comfort 35. Sony’s aforementioned microphones come into play here, too. While the mics themselves can’t tell the difference between the annoying drone of an airliner’s engine and the sound of a flight attendant asking if you’d like a drink, the digital signal processor they’re connected to—Sony’s Sense Engine—can. The DSP has four modes. The first is Personal NC Optimizer, which runs three series of sound sweeps to analyze your personal characteristics and how you wear your headphones—Sony says it can even compensate for the break in the ear-cup seal caused by wearing eyeglasses. It then optimizes the sound accordingly. I found the NC Optimizer to be highly effective in my tests in both quiet and ambient-noise-heavy environments. The second is Quick Attention mode. And it’s brilliant. Hold you hand over the right ear cup, and the music will drop to a whisper so you can hear everything around you. Lower your hand and your music returns instantly. It’s an eminently practical feature, but it’s far from sonically perfect. It worked as advertised every time I tested it, but hiss and digital artifacts made it sound like I was in a garden with birds chirping in the background. Two ambient sound modes—normal and voice—keep you aware of your surroundings while you listen to your music. Ambient sound mode is enabled—and active noise cancellation disabled—when you press a button on the rear left ear cup. Pressing the button toggles between the two modes, and the external sounds you want to hear will come through the headphones along with the music. Ambient Sound Normal Mode is very good. I tested it in both an airline terminal and during a four-hour flight and found that I could lift one or both of the ear cups and hear little difference between wearing the headphones or taking them off. The ambient noise level was also very consistent with my surroundings. I couldn’t increase or reduce it using the built-in volume controls. The right ear cup on the MDR-1000X acts as a gesture-control pad. Ambient Sound Voice Mode worked for announcements or if someone was speaking to me while I was wearing the headphones, but I found its effectiveness (or should I say annoyance) varied based on my surroundings. In my tests, Voice Mode was superb at home and in low-noise environments. I never had any problems. But, when I was in high-noise environments, such as an airport terminal, a cafe, or even in an airplane, Voice Mode had significant trouble. In the airline terminal, for example, it was like I suddenly had super-hearing. Small sounds such as crumpling paper or plastic became annoyingly intense and amplified. During in-flight announcements, voices sometimes exhibited audible clipping and harshness. Some in-flight announcements were even unintelligible and sounded like the “wah wah wah” adults in a Charlie Brown movie. The bottom line is that all the modes work as advertised, but their effectiveness varies according to your surroundings. The MDR-1000X’s performance in real-world, road-warrior environments—airplanes, cafes, and airports—was impressive. I tested the MDR-1000X with an Onkyo DP-X1 and Astell&Kern AK70 high-res DAPs (reviews of both are forthcoming), an iPhone 7, and an iPad Air. I used the headphones wirelessly about 80 percent of the time, and in wired mode 20 percent of the time. External and internal microphones on the ear cups are part of the secret to Sony’s excellent noise-cancelling performance. These are great-sounding wireless headphones, but be warned: the MDR-1000X has a split personality when wired. Use the included five-foot cable, but leave the headphones turned off, and they’ll sound two-dimensional: Thick in the mid-range and dull at the top end. I didn’t like it. I tested my observations with several DAPs and a NuForce DAC/headphone amp and had the same negative experience each time. Turn the headphones on (even without noise cancellation engaged) and the mid-range and top end immediately open up. They sound detailed and very well balanced. You’ll enjoy the MDR-1000X most when they’re powered up. While sitting at a Peete’s Cafe at the Houston Airport, the MDR-1000X did a superb job of lowering the noise floor and cancelling out ambient music around me. Consequently, I found that I could play my own music at lower levels and hear more detail than I could with the Bose QC35. Switching between the two headphones in the cafe, I consistently found that I had to play the Bose QC35s about 20-percent louder than the Sony to get the same level of musical satisfaction. The Sony headphones eliminated most traces of Justin Bieber’s “Sorry” and Daughtry’s “What About Now” blaring out of the cafe’s PA system. I felt and heard more bass thumps with the Bose. 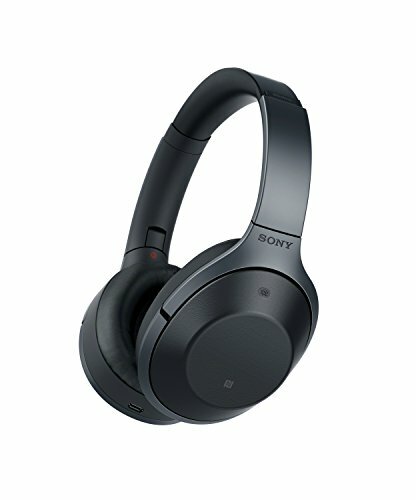 In this and similar contexts, I found the Sony’s active noise cancellation to be superior to Bose’s. You can hear the world around you by placing your hand on the right ear cup. That all changed, however, once I got in the airplane. 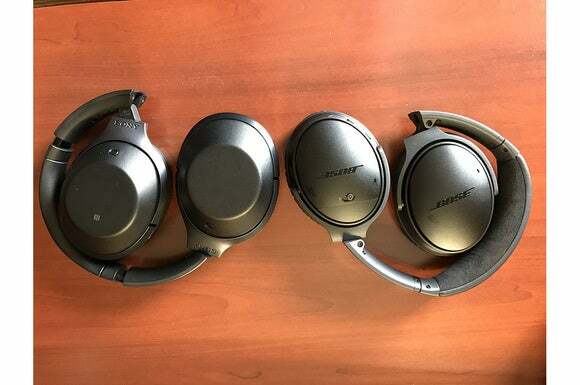 The Bose QC35s must be optimized specifically for air travel, because they were nothing short of spectacular at eliminating engine noise in flight. I switched between the two pairs several times during my four-hour flight. 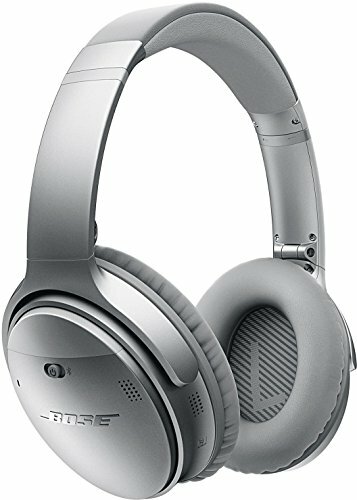 The MDR-1000X were really good, but they just couldn’t knock out the Bose. The way in which I used Sony’s Personal NC Optimizer also made a big difference. When I opened up the overhead air vent during my flight, for example, I heard the “shhhh” sound loudly in my ear cup when I turned my head. I ran the optimizer a second time while tilting my head side to side, so that the air hit the headphone. This time when the optimizer finished, the noise cancellation blocked out the majority of the ambient noise plus the vent sounds. 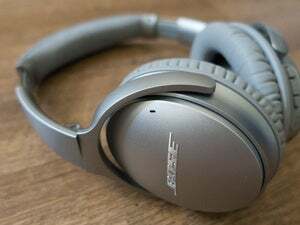 When it came to noise cancellation plus music or movies, however, I much preferred the Sony’s warm, balanced sound to the Bose’s comparatively thin voicing. 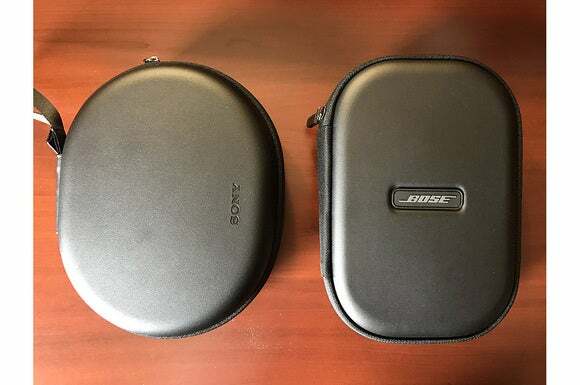 No matter how many times I switched between the two, I always preferred the Sony to the Bose in flight. Buttons on the MDR-1000X’s left ear cup activate active noise cancellation and Sony’s Ambient Sound Modes. Sony’s MDR-1000X are stellar headphones with scary-good noise-cancelling abilities in a wide range of environments. They deliver great musical performances, and they’re loaded with high-end features. They’re a fantastic choice for music-loving road warriors. If all you really care about is noise cancellation inside an airliner cabin, on the other hand, the Bose QC35 carry the day. With its fabulous MDR-1000X noise-cancelling headphones, Sony is putting Bose on notice. These cans deliver a one-two punch of great sound and terrific active noise cancellation.